It wasn’t long ago the Chicago Blackhawks were considered a dynasty. In 2015, the Blackhawks became the first team since the Detroit Red Wings (1997, 1998 and 2002) to win the Cup three times in six seasons, and they did it with three different Conn Smythe winners, a truly amazing feat in the salary cap era, where it is more difficult to keep teams together. But those fun times are gone and the future looks bleak for Chicago. The Blackhawks are in danger of missing the playoffs in back-to-back seasons for the first time since 2007 and 2008 and, worse, they’re hamstrung by weighty contracts to each of the core members of the championship group. Patrick Kane, Jonathan Toews, Duncan Keith, Brent Seabrook and Corey Crawford, who is on injured reserve, account for a combined $39.4-million (U.S.) cap hit. Each skater also has a no-movement clause while Crawford can provide a 10-team no-trade list, making it difficult to move any of them for younger, cheaper assets. Handing out lucrative contracts to star players isn’t a bad idea in isolation, but it did erode two of Chicago’s advantages over the competition during their dominant six-season stretch: depth and the ability to possess the puck. For example, there was a time during the 2014-15 season when Sharp, a four-time 30-goal scorer, skated on the team’s third line. In 2018-19, the team’s third line of Brandon Saad, David Kampf and Drake Caggiula has been outshot 7-15 and outscored 0-3 at even strength this season while skating 21 minutes together. The second line of Artem Anisimov, Dylan Strome and Kane has a slight edge in even-strength goals (7 to 6) but are underwater in scoring chances (55 to 85), especially those from the high-danger areas such as the slot and the crease (19 to 44). The only line combination that isn’t a disaster for Chicago is the top line of Toews, Alex DeBrincat and Dominik Kahun. 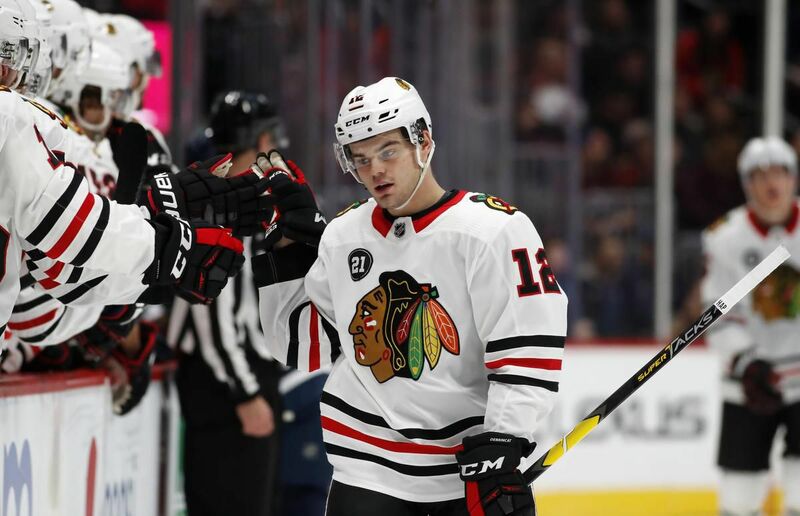 DeBrincat has 24 goals in 49 games, a 40-goal pace, with the second-most scoring chances (144) on the team; Toews is scoring 0.9 points per game, his highest rate since 2013-14; and Kahun, a 23-year-old rookie, has seven goals and 12 assists, the latter good enough to place him seventh among all rookies this season. However, Toews and Kahun have been on the ice for an above-average amount of high-danger chances against. They aren’t the only ones: among forwards playing at least 300 minutes this season at even strength, four of the 10 players seeing the most high-danger chances against them are on the Blackhawks, as are six of the worst 25. On the blue line, the 35-year-old Keith is starting to slip. When he won his second Norris trophy in 2014 (his first was in 2010) the Blackhawks saw 58 per cent of high-danger chances at even strength go in their favour with him on the ice. This year that number has plummeted to 42 per cent. From his rookie season in 2007-08 to 2016-17 Chicago outscored opponents 629 to 529 with Keith on the ice; over the past two years they have been outscored 88 to 114. The lack of depth and production on both sides of the ice has caused Chicago to languish at the bottom of the standings and, if you adjust their goal differential to account for strength of schedule, this year’s squad is the worst performer since the 2005-06 Blackhawks, a team that finished the regular season with a 26-43-13 record. And, unfortunately, there is no respite in sight. With so many aging and ineffective players taking up cap space, the Blackhawks won’t have much room to improve next season. According to CapFriendly, the team will have $18.7 million in cap space to sign nine players in 2019-20 and per Sean Tierney’s Wins Above Replacement tool this squad, as is, could be expected to accumulate 81 standings points. That is a far cry from where this franchise was and wants to be.